This is satirical science fiction from 1936, about the discovery of a species of intelligent amphibian living in the sea next to a small island near Sumatra. The ‘newts’ are exploited and traded, initially as pearl fishers and then as cheap labour on massive marine construction projects, until they are present in huge numbers all around the world; and then — spoilers, I guess, but the clue’s in the title — they start fighting back. I bought it because it was recommended on the Book Shambles podcast, but even so it turned out to be much more entertaining and readable than I expected. The satire is not as focussed as, say, Nineteen Eighty-Four; the biggest targets are colonialism and racism, with the trade in newts modelled on the slave trade, but along the way it takes pot shots at nationalism, capitalism, fascism, Hollywood, newspapers, scientists and much else. I read the Robert and Marie Weatherall translation from 1936; I certainly enjoyed it, although Wikipedia suggests that the more recent Ewald Osers version is more highly regarded. I did already have the Czech Republic ticked off for the Read The World challenge when I started — I’ve read Kafka and Hašek and whatnot — but this is the first Czech book I’ve read since then, probably. 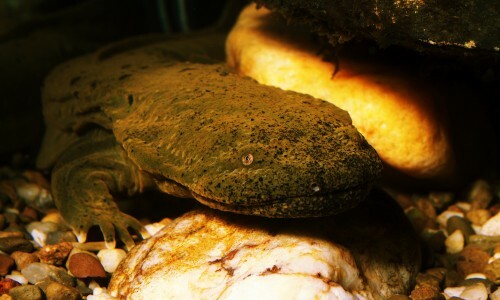 » The photo is a tweaked version of ‘Hellbender at the National Zoo, Reptile Discovery Center’, © Brian Gratwicke and used under a CC-by licence.